Hurricanes Are Not Caused By “Climate Change.” Just Nature At Work. 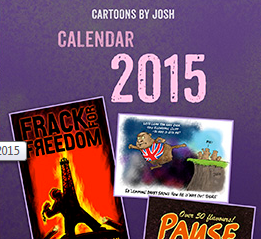 Trying to impose pre-conceived dogmatic ideas about the climate onto random weather events is never going to work. “They say that we had hurricanes that were far worse than what we just had with Michael,” said Trump, who identified “they” as “people” after being pressed by “60 Minutes” correspondent Leslie Stahl. She asked, “What about the scientists who say it’s worse than ever?” the president replied, “You’d have to show me the scientists because they have a very big political agenda. A rating system that may lead people to misunderstand the likely impact of an approaching storm is obviously not satisfactory. So is there a better approach? For decades, hurricanes have been rated on a scale of 1 to 5 based solely on a storm’s wind speeds. But as recent hurricanes show, a tropical cyclone’s winds often tell us little about its real threats — coastal storm surge and precipitation-driven flooding, say Yale researchers. Modern meteorological data collection gives us an unprecedented view into the real-time growth, track, and death of tropical cyclones. It’s been a couple of weeks since Hurricane Florence made landfall as a Category 1 storm. The weakening from a Category 4 storm must’ve really tweaked alarmists. NOAA just updated their much-adjusted ERSST.v5 sea surface temperature dataset to include September 2018 data. So let’s take a look at the September sea surface temperature anomalies for Florence’s full storm track. Right on cue at the peak of the Atlantic hurricane season, three major storms are barrelling westwards. So far, the first one looks like being the most powerful. Mandatory evacuations for more than a million people near the US east coast have been declared. 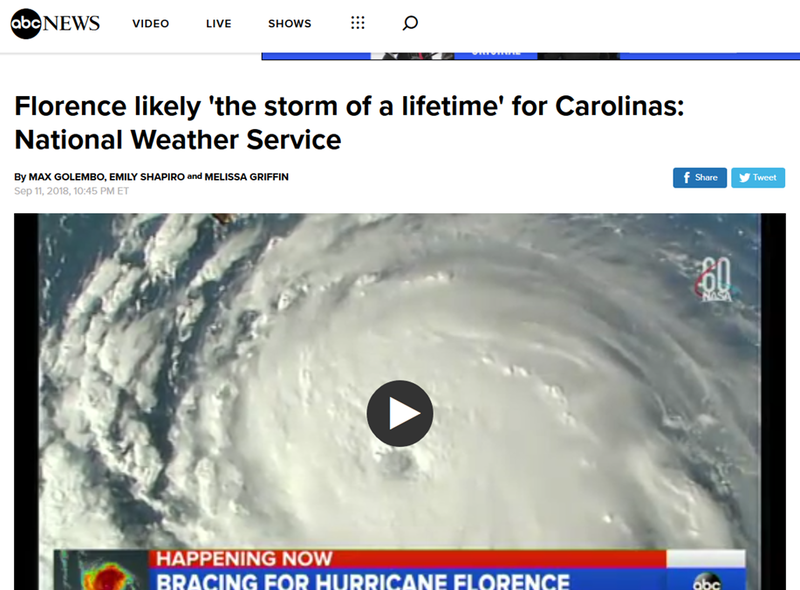 North Carolina’s governor warns the state Florence will be a “life-threatening, historic hurricane”, reports BBC News. Hurricane Florence – the most powerful storm to threaten the Carolinas in nearly three decades – is expected to strengthen, say forecasters. 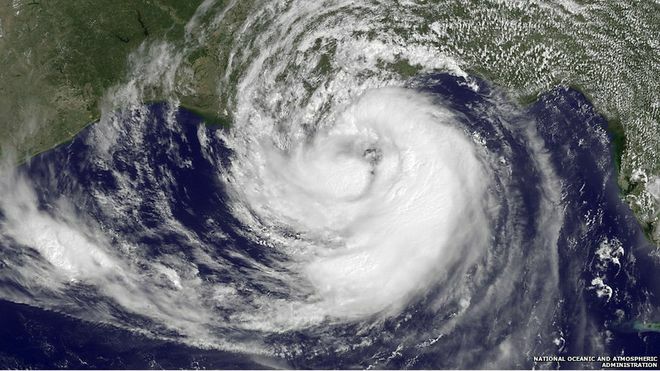 US researchers who accurately forecast last year’s busy Atlantic hurricane season are not expecting a similar level of activity this year, partly due to lower sea surface temperatures as El Niño effects fade away. Hurricane season didn’t officially start until June 1, but Subtropical Storm Alberto made an appearance early, causing more than $50 million in damage as it made its way inland and up the coast in late May, reports Phys.org. Twelve people—seven in Cuba and five in the U.S.—died as Alberto’s fallout included flooding, landslides, tornados and mudslides. Is Alberto’s early-season appearance an indicator of another active Atlantic hurricane season? Not necessarily, according to predictions by researchers at the University of Arizona. The role of social media in mitigating the human cost of natural disasters may also have been significant. About 30,000 people die from natural disasters per year. This year, the number was closer to 6,000, writes Seth Borenstein in the Toronto Star. North America couldn’t catch a break in 2017. Parts of the United States were on fire, underwater or lashed by hurricane winds. Mexico shook with back-to-back earthquakes. The Caribbean got hit with a string of hurricanes. The rest of the world, however, was spared more than usual from the drumbeat of natural catastrophes. Preliminary research shows there were fewer disasters and deaths this year than on average, but economic damages were much higher. 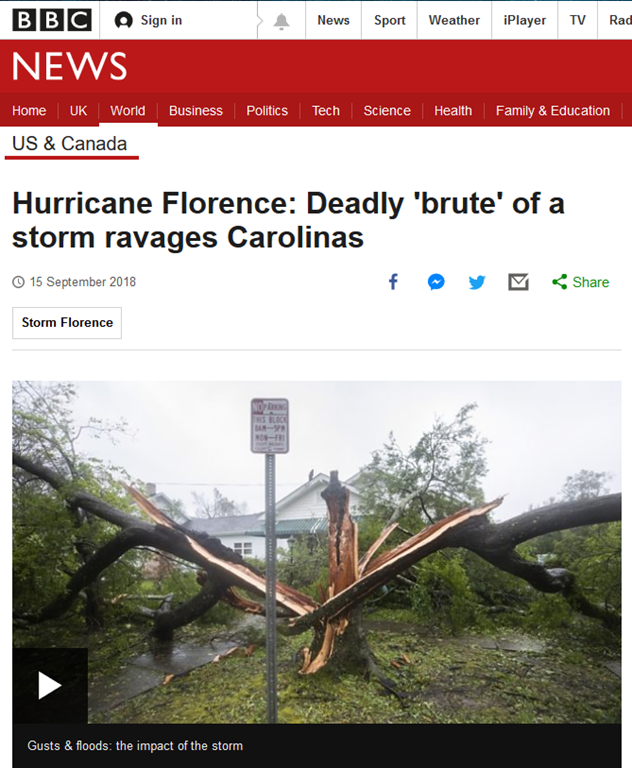 Looks like a fairly sober BBC analysis from weather forecaster Chris Fawkes, avoiding some of the more extravagant climate claims the BBC is sometimes guilty of. The past year has been a busy one for hurricanes. There were 17 named storms in 2017, 10 hurricanes and six major hurricanes (category 3 or higher) – an above average year in each respect. The 10 hurricanes formed consecutively, without weaker tropical storms interrupting the sequence. The only other time this has been recorded was in 1893. Are these storms getting worse? And does climate change have anything to do with it? 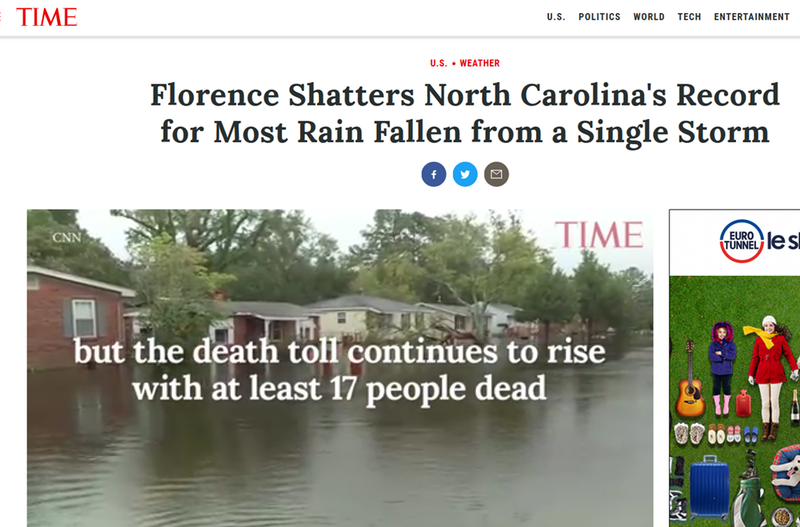 A rational look at recent severe weather events, which have been seized on by disaster-starved climate alarmists to push their pre-conceived agendas. 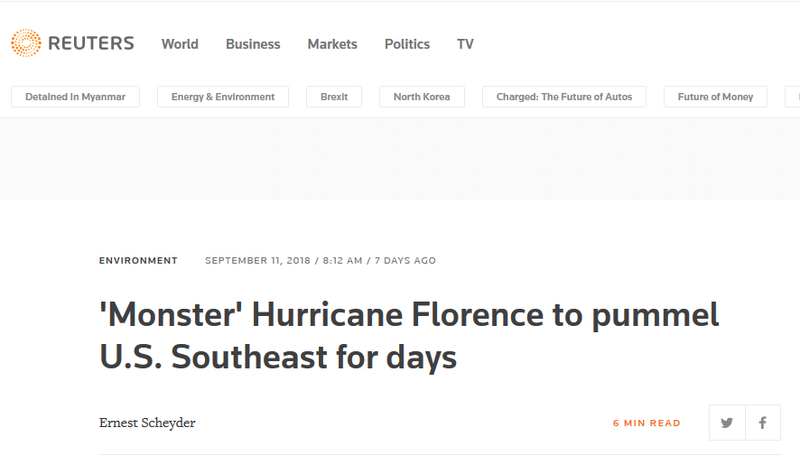 The recent spate of hurricanes has inevitably attracted attention and spawned wildly inaccurate headlines, such as “a 1000 year event”, “the most powerful Atlantic storm on record”, “storm of the century”, and even “most deadly storm in history”. 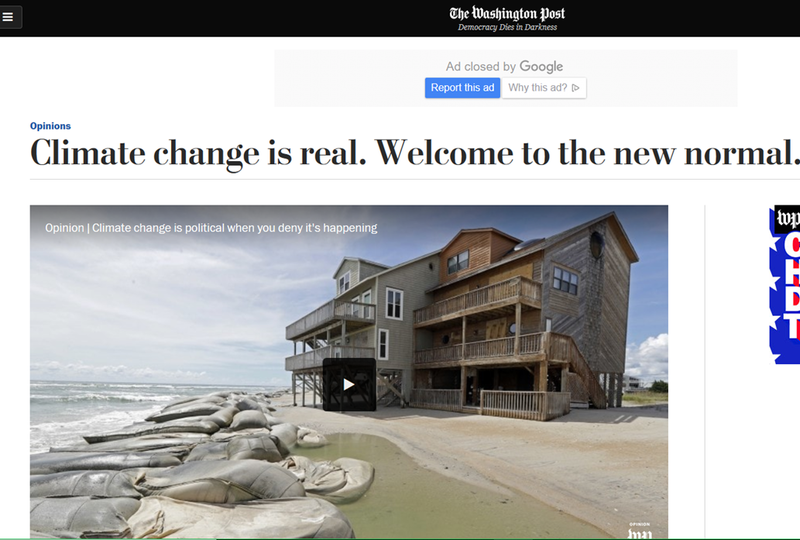 Many climate scientists have also jumped on the bandwagon, to claim that these storms have been exacerbated by climate change. With Hurricane Maria now weakening and heading north into cooler waters, it is perhaps time to take a rational look at what has actually been happening. 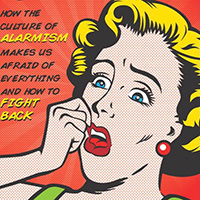 Taking a look beyond the over-simplistic climate hysteria that arises as if by a jolt on the electrodes every time a major weather event occurs, especially if it’s in or near the USA. Summary: Millions of words were expended reporting about Hurricanes Harvey and Irma, but too little about the science connecting them to climate change. Here are the details, contrasted with the propaganda barrage of those seeking to exploit these disasters for political gain. Let’s listen to these scientists so we can better prepare for what is coming. Failure to do so risks eventual disaster. 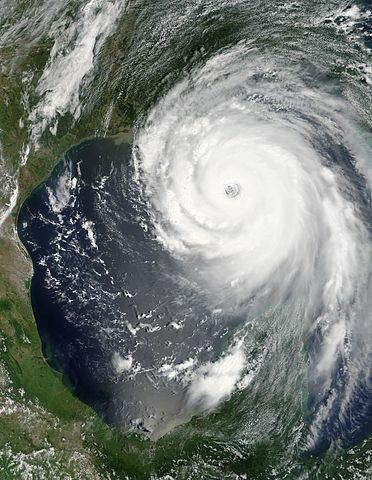 NASA photo of Hurricane Katrina on 28 August 2005. Although some climate alarmists contend that CO2-induced global warming will increase the number of hurricanes in the future, the search for such effect on Atlantic Ocean tropical cyclone frequency has so far remained elusive, reports CO2 Science. And with the recent publication of Rojo-Garibaldi et al. (2016), it looks like climate alarmists will have to keep on looking, or accept the likelihood that something other than CO2 is at the helm in moderating Atlantic hurricane frequency. In their intriguing analysis published in the Journal of Atmospheric and Solar-Terrestrial Physics, the four-member research team of Rojo-Garibaldi et al. developed a new database of historical hurricane occurrences in the Gulf of Mexico and the Caribbean Sea, spanning twenty-six decades over the period 1749 to 2012. 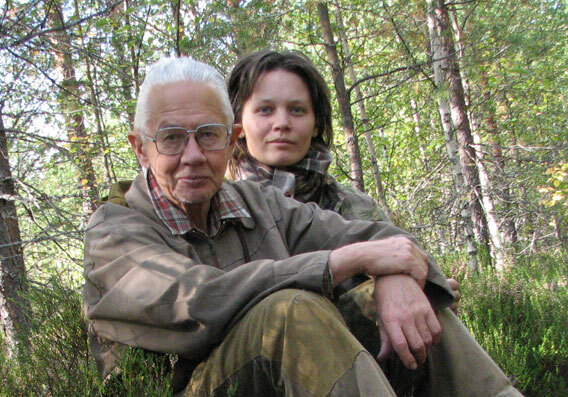 Our old friend Anastassia Makarieva has a new paper in press with her colleagues Victor Gorschov and A.V. Nefiodov: ‘Empirical evidence for the condensational theory of hurricanes’. A preprint is available here. This theory is an extension of her earlier work on where winds come from, which we discussed a couple of years ago. We derived the relationship between the gravitational power of precipitation and air velocity in the windwall from the previously developed theory of condensation-induced dynamics [3,5]. 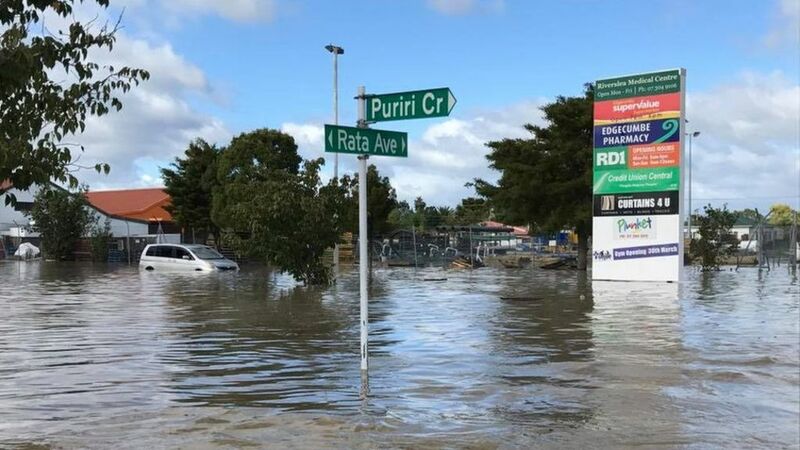 We emphasize that the gravitational power of precipitation exists irrespective of the dissipation of the kinetic energy of hurricanes (distinct from the interpretation given in work ). The hurricane power budget would remain the same even if precipitation occurred in free fall with rain drops not interacting with atmospheric air. We have highlighted this before, but the period just keeps getting longer, much to the relief of many U.S. citizens no doubt. 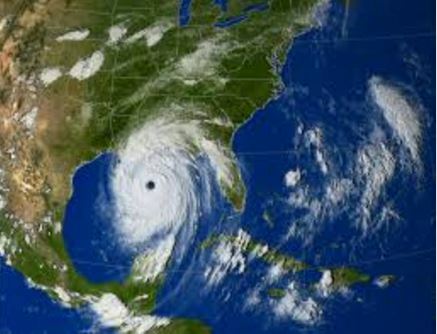 CNSNews.com reports: It has been 117 months since a major hurricane, defined as a Category 3 or above, has made landfall in the continental United States, according to 2015 data from the Hurricane Research Division of the National Oceanic and Atmospheric Administration (NOAA). This is the longest span of time in which no major hurricane has struck the mainland U.S. in NOAA hurricane records going back to 1851. 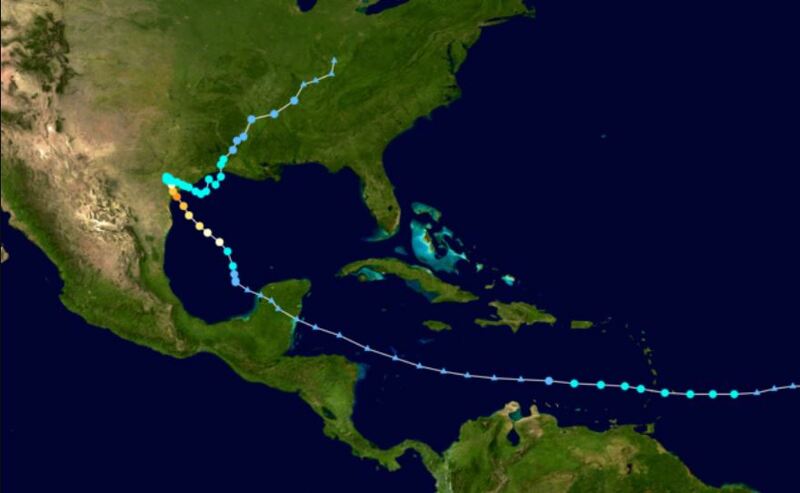 No Major U.S. Hurricane Landfalls in Nine Years: Luck? The United States hasn’t experienced the landfall of a Category 3 or larger hurricane in nine years – a string of years that’s likely to come along only once every 177 years, according to a new NASA study. 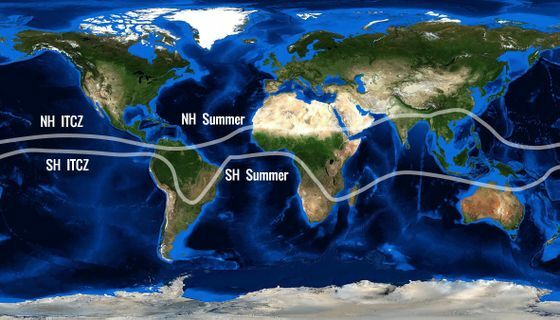 The current nine-year “drought” is the longest period of time that has passed without a major hurricane making landfall in the U.S. since reliable records began in 1850, said Timothy Hall, a research scientist who studies hurricanes at NASA’s Goddard Institute for Space Studies, New York. 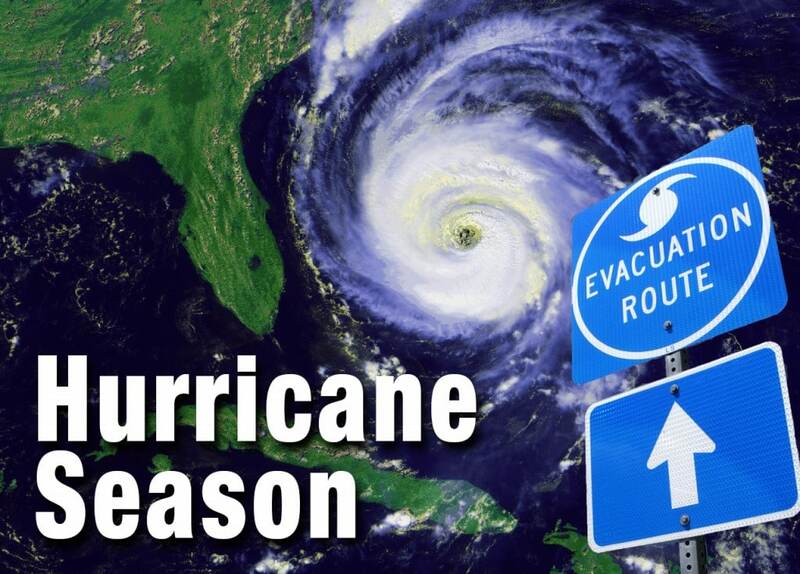 Statistical analyses from hurricane track data indicate that for any particular Atlantic Hurricane season, there is about a 40 percent chance that a major hurricane (category 3 or higher) will make landfall in the continental United States. However, during the period from 2006 to 2014, no major hurricanes have made landfall.